Funeral Directors and Embalmers in New Mexico are required to complete 10 hours of continuing education every year. The deadline is June 30th annually. 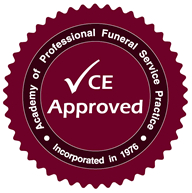 Funeral Service Academy has been assigned approved provider #1107. The following courses have been approved by the New Mexico Thanatopractice Board.